Sandra Lee hosts Godiva presents SWEET, the opening party of NYC Food Network Wine & Food Festival presented by FOOD & WINE. Photo from NYC Wine & Food Festival Web site. THE burger bash is back; ditto for the mad meatballs and so is Rachael Ray. Gone is last year’s Oasis lounge, the closing party in Guy Fieri's garage and Emeril Lagasse. New is a roast and collaboration with a renown culinary institute. Despite it all, foodies will find more than enough to savor during the fifth annual Food Network NYC Wine & Food Festival presented by FOOD & WINE (NYCWFF). Over the course of four days (11-14 Oct.), starting tomorrow through Sunday, the festival will feature some of the best drink and food New York City has to offer. It is a place where Food Network and nonFood Network top chefs and culinary stars will be talking and tasting, demo-ing and dining, signing and searing. Of course, this jollification is for a good cause. All of the dough produced from raising glasses and washing down hamburgers and finer fare goes to the Food Bank For New York City and Share Our Strength. In its short existence, NYCWFF has generated more than $5 million clams in the cause of fighting hunger. Fried chicken will be the main dish when Art Smith jaws about why his is all that. Photo from NYC Wine & Food Festival Web site. One huge draw this year – in fact the NYCWFF opener is already sold out – is On The Chopping Block: A Roast of Anthony Bourdain. For the occasion, Michael White & the Altamarea Group Chefs are preparing a four-course meal with a wine for each course. It includes Bottarga Tocco, Sardinian Caviar Mousse and Brancott Estate Marlborough Sauvignon Blanc 2011, as well as Ricotta Ravioli, Sardinian Pecorino, Pomodoro, Saffron Oil and Campo Viejo Reserva Rioja 2007. Presumably after the meal, AB will have his head served on a platter by Gilbert Gottfried, Marc Maron, Jim Norton, possibly Sarah Silverman and other unsavory sorts. Dessert-lovers should note that Friday night’s opening party, Godiva presents SWEET, is not yet sold out. Hosted by Sandra Lee, this one promises treats along the lines of confectionary cakes, artisanal ice creams and (of course) Godiva chocolates. 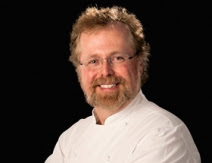 Chef Nathan Myhrvold is said to be planning an unparalleled dining experience. Photo from NYC Wine & Food Festival Web site. For the first time, The International Culinary Center (http://www.internationalculinarycenter.com/) is participating in NYCWFF. On its menu are numerous cooking classes, tastings, high-tech cocktails and dinners, including the Dinner to End All Dinners hosted by Nathan Myhrvold (“The Cookbook to End All Cookbooks”). It’s billed as a superlative dining experience. Also making its NYCWFF debut is the three-night Bank of America Dinner Series. On the 51st floor of the new Bank of America Tower (One Bryant Park), the Korean BBQ Dinner hosted by Roy Choi with Jean-Georges and Marja Vongerichten has been christened as one of the inspired meals prepared for a select few. 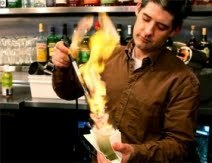 When cocktails go high tech things might get a little heated. Photo from NYC Wine & Food Festival Web site. Another missing ingredient from year five of NYCWFF is Chelsea After Dark, which heretofore had been the main event on opening night. 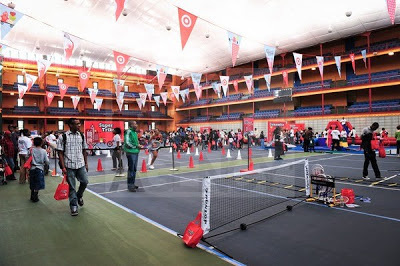 But this concoction of a festival will survive just fine without it for no other reason than the presence of the perennial Grand Tasting presented by ShopRite featuring KitchenAid Culinary Demonstrations on Saturday and Sunday. Andrew Zimmern (“Bizarre Food”) will show for the Grand Tasting, as will Ina Garten (“The Barefoot Contessa”). The Aruba Tourism Authority will be making the case for a visit. Equinox will no doubt be making the case for foodies to visit one of its gym to keep fit and/or to work off, if necessary, Monkey Bar’s Rohan Duck (braised salsify, Chanterelles), reBar’s Beef Heart (spicy pan-seared: house made sriracha, mung beans, scallion) and dishes from any of the other restaurants that will be setting out plates. Fun and Fit in the City was a hit at the Harlem Armory last year and is back this year at Basketball City (Pier 36.) Photo by Diana Eliazov/Billy Farrell Agency. Speaking of keeping fit, there is Fun and Fit in the City hosted by Guy Fieri. Sponsored by Target this year, it is a daylong affair on Saturday that focuses on teaching families about eating healthy and maintaining a proper weight, especially if one weekend encompasses both Blue Moon Burger Bash presented by Pat LaFrieda Meats (Rachael Ray returns as the host after last year’s absence.) 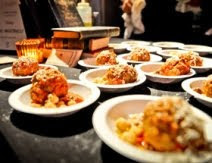 and S. Pellegrino's Meatball Madness hosted by Giada De Laurentiis. Every year at NYCWFF, they seem to go mad about meatballs. Photo from NYC Wine & Food Festival Web site. Some of the City fit fun includes dancing, a superhero puppet show and healthy food samplings prepared by Sunny Anderson and others. Also families can choose repacking, defined as an activity whereby parents and kids pack a box of donated goods that will be given to families served by Food Bank For New York City. 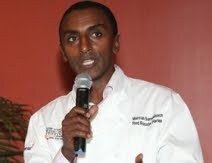 Marcus Samuelsson will share how he goes all out for flavors. Photo from NYC Wine & Food Festival Web site. Last but not least is street food in the form of festival closer, Trucks & Train hosted by Andrew Zimmern. The band Train will provide music to accompany the chow of Big Gay Ice Cream, King of Falafel and Shawarma, Korilla BBQ, Rouge Tomate, Schnitzel & Things and co. Accompanying both the music and chow are some libations from Save Me, San Francisco Wine Co.: “Drops of Jupiter™” Petite Sirah, “Calling All Angels™” Chardonnay, and “California 37™” Cabernet Sauvignon. It all sounds like delicious fun! 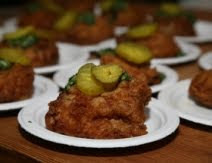 Visit http://www.nycwineandfoodfestival.com/ to learn more about the Food Network New York City Wine & Food Festival, including ticket information, complete schedule and venues. Visit http://www.foodbanknyc.org/ to learn more about the Food BankFor New York City. 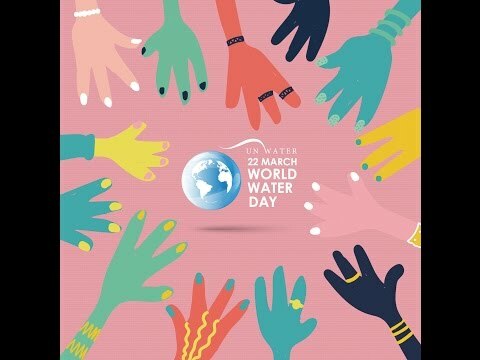 Visit http://www.strength.org/ to learn more about Share Our Strength. But the replacement stuff has been nice, no? I heard that the ROAST was smashing, and there has been buzz about the culinary center stuff.